Are you looking to become the next Andre the Giant? You’re certainly not going to pull it off if you aren’t wearing the proper kind of footwear. When was the last time you ever saw your favorite wrestling here enter the ring in his sneakers? Never, you puny excuse for a human being! I’m gonna pounce & trounce you for even thinking about getting into the ring without a decent pair of manly wrestlers on your feet! Haha, whoops… sorry, I tried not to break into my alter ego wrestling character, but I couldn’t hold myself back. Yeah, I’ve done some wrestling in high school. I’m not proud of it… (cuz I sucked at it), but at least I had a great time and I never broke anything! You’re not going to become the next WWE star without proper shoes. So let’s dive, er… body slam straight in, shall we! Wrestling is a sport that requires technical precision combined with body control where those with skill and passion tend to excel. The wonderful folks at ASICS certainly understand that as they have mixed those traits and applied them to the ASICS Men’s Matflex 5 Wrestling Shoe. It’s a shoe grapplers around the world have turned to time and again not just because of the all-around quality of the shoe, but because it’s that rare shoe that gives you everything a wrestling shoe should with an affordable price tag. Weighing at 8.3 ounces, the Matflex 5 gives you the support your foot and ankle need for the challenging sport along with astounding comfort. The materials used are textile and synthetic with a gum rubber sole. Why gum rubber? Wrestling takes place on a mat with a surface that is yielding so you want the grip of the shoe to be somewhat yielding, as well, and gum rubber is just that. So the traction is sure and certainly one less than to worry about when facing down your foe. The lacing system, or garage, is traditional with a layout for security and comfort. The fabric used is made for enhanced breathability and tremendous support. We might as well get this blurb out of the way: ASICS is well-represented on this list of the best 35 wrestling shoes and for a good reason. When Kihachiro Onitsuka founded the athletic shoe company in 1949 in Kobe, Japan, he set out to create sports shoes of unparalleled excellence at affordable prices. And wrestlers throughout the world will attest to his success, specifically because ASICS wrestling shoes are staples in gymnasiums everywhere, especially on the wrestling mat. The Men’s Split Second 9 Wrestling Shoe offers a unique feature with a split-sole which is brilliant as it gives grapplers much more flexibility. The innovative tread pattern also allows for better control and traction in the crucial pivot points wrestlers utilize when going for the pin. Even when a wrestler is at a disadvantage, the split-sole design allows for unparalleled performance. The mesh fabric is exceedingly breathable which adds a level of comfort unmatched in the upper in other wrestling shoes. It encourages a continual fresh air flow, keeping the athlete’s feet cool throughout training or during the match. The rubber is specialized designed to work well for the traction necessary on the rubber wrestling mats (though many modern mats are now made polyethylene foam and vinyl). The lacing is traditional. Currently, in its 8th generation, the Asics Cael is a great pair of wrestling shoes, which delivers the same impressive performance as the previous versions. It’s designed to keep you light and comfortable on your feet, thus allowing you to focus on your opponent. These wrestling shoes cross training, feature a synthetic and mesh upper, while the outsole is made of rubber. It doesn’t matter how long the fight drags on. As long as you have these shoes on, your feet will remain cool, fresh, and comfortable. They are equipped with a conventional lace-up closure, combined with a lace garage. Thanks to this design, the laces will remain securely in place, thus eliminating chances of tripping during training or fighting. The integrated lace garage design also complies with competition rules. These wrestling shoes for men also come with an Ortholite sockliner, which provides a snug and comfortable fit. Also, the sockliner wicks away moisture and sweat, leaving your feet dry and fresh, regardless of how long or hard you work. A padded ankle area provides your ankles with support while allowing maximum flexibility. Furthermore, these shoes are furnished with adequate cushioning for shock absorption and impact attenuation. The ASICS Men’s Snapdown Wrestling Shoe is a marvel of innovation from the Kobe, Japan-based athletic footwear giants. The Snapdown is unique in that it is a mid-level shoe, which means the shaft runs from mid-top from the arch of the foot. It also is exceptional due to its feature of a full-length outer sole. This allows for the forefoot and rear of the foot to utilize a “serradial” traction pod (which is wrestling-specific) which provides outstanding grip and flexibility. The entirely new and innovative upper part of the shoe is made with a leather (suede) and synthetic (single-layer mesh) which makes it exceedingly comfortable, flexible, and breathable to keep the feet cool throughout training or the match. The lace garage is integrated, combined with eyelets and support slots throughout the garage and tongue to make the fit as personalized and comfortable as possible. Another cool thing about the Snapdown is the color choices, especially if you’re a coach or athletic director looking for specific school colors. And since it’s performance of any ASICS wrestling shoe is legendary and the Snapdown especially so, the company still manages to make a shoe like this one very affordable so as not to break the bank. The ASICS Men’s JB Elite Wrestling Shoe is special. It looks like a classic, retro wrestling shoe with sparkling colors (though other color options are available). The primary color design is true red, white, and Olympic gold. ASICS teamed up with world and Olympic champion Jordan Burroughs (his mark is on the shoe). It’s that rare shoe that meets (and exceeds) tournament regulations. It has a split rubber sole (split front and back) for incredible flexibility, cushioning, traction and control. It’s upper is constructed out of single-layer mesh and synthetic leather for comfort and breathability. The synthetic leather is a skin-suede for unmatched durability. The overlays are a seamless TPU (thermoplastic polyurethane elastomers) which allow for amazing ventilation, greater comfort, and outstanding fit. The lacing garage is integrated with eyelets and slots for functionality and a great personalized fit. It also sheds weight on a traditional lacing garage and has a thinner tongue and designed for quicker lacing. The shoe is about as advanced as you can make a wrestling shoe yet surprisingly affordable. ASICS is renowned for manufacturing and designing shoes that are durable, and the JB Elite certainly falls into that category while also allowing for lightning speed, a necessary trait for grapplers. Adidas’ first entrant on this list of the top 35 wrestling shoes is the Men’s Combat Speed 4. It’s a shoe with an impressive 5.1-inch shaft (measured from the arch). The Combat Speed 4 is a classic, retro wrestling shoe that has been around for a while and considered as a go-to wrestling shoe by athletic directors and coaches the world over. It certainly looks the part as it simply looks like a durable and effective wrestling shoe should. Its outer sole is made with split-suede leather for incredible grip and has a die-cut, internal EVA midsole. It boasts of a “sock-like” fit made possible by a single-layer mesh upper body that makes it extremely comfortable and breathable. The supportive TPU has three stripes with a side panel that is integrated with an integral support strap for outstanding flexibility. As with any wrestling shoe, weight is important. So Adidas has made the shoe ultra-lightweight for lightning speed and agility. adidas also likes to let it’s customers in on the importance of choosing the correct size. The company claims that their wrestling shoes tend to run a tad small, so when ordering make sure to add half a size to whatever size athletic shoe (running shoe or gym shoe) that you currently wear. ASICS Men’s Aggressor 2 Wrestling Shoe is a high top shoe that ASICS says is the “wrestler’s wrestling shoe,” and how can you argue? You certainly don’t purchase a wrestling shoe solely on how the shoe looks, but it doesn’t mean that looks can be discounted, either. The treaded leather sidewall is the first thing that grabs your attention when you see this wrestling shoe, and it allows for an incredible grip and traction whenever you need it, even for those split-second moves you make to counter your opponent in the heat of the match. The designers used a wrestling-specific last (foot shape), and with a form-fitting and super soft Escaine upper, it’s as comfortable, breathable, cool and durable as a wrestling shoe of this caliber should be. The lace garage has a front panel that allows for ideal personalization when it comes to fit, and the ankle tab is made with a hook-and-loop closure for even better comfort. The designers paid particular attention to the weight of the Aggressor 2 because they understand that a wrestler needs speed and flexibility, and with an ultra-lightweight and performance-enhanced shoe, you’re guaranteed to maintain the traction you desire and functionality when you need it. Another high-top wrestling shoe to make the top 35, the ASICS Men’s Cael V6.0 features an Escaine airy mesh upper for maximum breathability. Escaine is a synthetic microfiber also known as Ultrasuede. 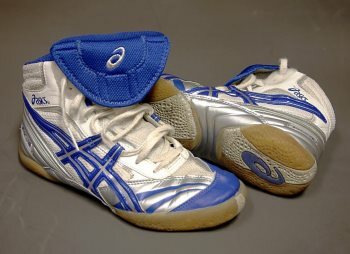 The shoe was designed by Olympic gold medalist, Iowa State University wrestling icon and current Penn State University head coach Cael Sanderson. His signature adorns the heel. He incorporated innovations along with classic feel and durability to create a shoe loved by grapplers the world over. The high-performance Cael V6.0 also features a sole design with maximum flexibility as the serradial forefoot, and rear traction pods will attest. They work sort of like suction cups as they provide excellent traction on the somewhat yielding wrestling mat. The lace garage has a unique eight-eyelet closure system which allows the wearer a personalized and comfortable, snug, glove-like fit. The Cael V6.0 also exhibits a ComforDry Sockliner for added cushioning as it also keeps the feet healthier, drier and cooler, no matter how long you wear it. The outer sole is made of a rubber compound which utilizes natural rubber rather than traditional leather. Since some wrestling mats are rubber and some a polyethylene foam and vinyl, so this compound allows for better traction regardless of the surface. ASICS’ Men’s Matflex 3 Wrestling Shoe is the third such Matflex offering on this list. It’s a wonderful all-around wrestling shoe packed full of features yet still remarkably affordable. It provides exceptional performance and is quite durable. The shoe was designed with California slip-lasting (foot shape), which just happens to be the most common lasting for athletic footwear. To make sure the wrestling shoe has maximum comfort and stability, the upper portion of the wrestling shoe is made with a highly breathable mesh material stitched around an EVA board (canvas) and then fastened to the midsole area. The full-length outer sole is constructed with a gum rubber compound for exceptional control and traction so when you’re in that epic battle; you’ll answer your opponent’s move and have that split-second ability to counter for that championship-winning pin. The shaft projects 3.3 inches from the arch area. The lacing garage is integrated and designed for speed and a personalized fit and also has a slot on the tongue to keep it from sliding down. The lacing garage also complies with all the rules and regulations when it comes to laces. When it comes to selecting the correct size, keep in mind some brands of wrestling shoes tend to run half a size too small, so know your size before ordering. Another design from the world and Olympic champion and three-time University of Nebraska All-American Jordan Burroughs, the ASICS JB Elite V2.0 Wrestling Shoe improves on the earlier version with a newly designed split-sole. The rubber compound is made of gum rubber, and the split occurs with the forefoot and rear utilizing wrestling-specific traction pods (serradial, which act like suction pods). This makes the shoe have traction and flexibility when you need it on any wrestling mat surface (namely, rubber or the newer polyethylene foam and vinyl mats). The updated and integrated lacing garage features a thinner, less bulky tongue and the eyelets and laces use technology which favors speed and meets or exceeds all tournament regulations. The upper portion of the wrestling shoe is significantly more breathable and utilizes a single-layer synthetic material to allow for optimal comfort and a more personalized fit. The advanced technology is in line with ASICS founder Kihachiro Onitsuka’s philosophy of enhancing and promoting complete health and fitness with the use of performance-driven athletic footwear like the JB Elite 2.0. ASICS researches and develops their sports shoes with an eye towards the more technical aspects of each sport. And in wrestling, that would be greater traction, comfort and foot control on the mat. The Adidas HVC Men’s Blue Synthetic Athletic Lace Up Wrestling Shoes falls just outside the top ten with this classic, retro wrestling shoe that falls into the all-around category, and it’s also a great shoe to be used in the boxing ring as well. It’s got the look and feel a wrestling shoe should have and comes in classic colors (black and white) too. The sole of this wrestling shoe is made with a gum rubber compound that gives you the stability, control, and traction you need for those testy moments when a split-second decision can mean the difference of either that championship-winning pin or getting pinned. The upper portion of the shoe and overlays were constructed and designed for lightweight durability and feature synthetic materials of suede and leather. It also utilizes a single-layer mesh material for maximum durability, comfort, and breathability. It has a lacing garage that was built and designed for speed and a personalized fit. Also, the HVC Men’s Blue Synthetic Lace Up is packed with the features you’ve come to love and expect from Adidas while remaining remarkably affordable and high-performance. Adidas cautions its customers to be diligent when selecting the right size, as their wrestling shoes tend to run half a size smaller than your other athletic shoes. The Adidas Wrestling Men’s Response 3.1 Wrestling Shoe is stylish with performance-enhanced features yet remarkably affordable. It makes the list of the top 35 wrestling shoes because Adidas is dedicated to not just high-quality athletic footwear, but making sure their wrestling-specific features help these athletes focus on the technical and physical aspects of their sport, and not their equipment. The Response 3.1 is made of synthetic and fabric materials. The mesh upper portion of the wrestling shoe provides additional comfort and maximum breathability. The gum rubber compound sole helps allow wrestlers the traction and control needed for split-second moves to pin an opponent quickly. The forefoot and rear of the sole each have grooved rubber pads for added stability and traction. Another feature of the sole is it is man-made which makes it longer lasting. The lacing garage is classically built for speed and a personalized fit. There’s also a Velcro strap at the top for additional stability. The shaft goes four inches from the arch area, and the toe area is rounded. Adidas wants its customers to know that when selecting the appropriate size, their wrestling shoes tend to run half a size smaller than your size for your typical athletic shoe. The ASICS Men’s Cael V7.0 Wrestling Shoe is an upgraded version of the V6.0, with the primary update a newly designed upper portion of the shoe. The Escaine (microsuede) synthetic leather material is combined with an air mesh material which significantly improves the breathability for a healthier foot as well as enhanced performance overall. The lacing garage gets an upgrade as well as it’s laces and eyelets were built for speed and a personalized fit as well as creating a pocket system so the laces are unexposed as they can be tucked in. The features mentioned above creates a less bulky feel for an extraordinary fit and unparalleled comfort. The sole is constructed with a gum rubber compound where the split-sole design allows for greater traction and control as the traction pads act as suction pads, which is ideal for the different types of surfaces of wrestling mats, primarily rubber and a polyethylene foam and vinyl popular with newer mats. The Cael V7.0 is the signature shoe of current Penn State University coach Cael Sanderson, who also is an Olympic champion and former Iowa State University All-American. When selecting the right size, wrestling shoes tend to run a half size smaller than typical athletic shoes. A wrestling shoe is the most important piece of a wrestlers equipment. Grappling successfully rests on footwork. One stumble or wrong move or a slippage or a stiff rubber sole can spell doom to a wrestlers chances in a match. So when Adidas designed the Performance Men’s Adizero Wrestling XIV Wrestling Shoe, they wanted to give wrestlers no cause to worry about any moves they make. Which is of vital importance between the ears for wrestlers of any skill level. The Adizero XIV has a couple of significant upgraded features to boast of. One is how the upper textile materials have been designed. It’s engineered with a two-piece mesh that is lightweight and allows for maximum breathability. It drys and deflects moisture as quickly as a championship-winning takedown or pin. The mesh is made of a microsuede material that looks and feels exceptionally comfortable. The outer sole has been simplified to take advantage of the sticky yet sturdy gum rubber compound. The pads kind of work as suction cups on the wrestling shoe, since wrestling mats are made of rubber or a polyethylene foam and vinyl material, each of which is somewhat yielding, so you need a material that will stick buy not too much so, you can have cat-like quickness. The ASICS Men’s Split Second 8 Wrestling Shoe really is attuned to what wrestlers go through on the wrestling mat. How else do you account for the designers coming up the two-piece sole idea? When a wrestler is in a tight spot and may be close to getting pinned, sometimes the need arises for independent movement of forefoot and heel for a necessary pivot to go a position of disadvantage to advantage in a split second. The enhanced flexibility is ingenious and the Split Second 8 boasts of this capability. As for other features, the cool color schemes are excellent but so is the asymmetrical lace garage which allows for less irritation and a more comfortable and snug fit. The lacing design also follows all tournament lacing rules. The gum rubber sole makes sure that you can count on traction for precision control when you need it and the mesh material of the upper portion of the wrestling shoe keeps your feet as dry as possible with maximum breathability. As with many wrestling shoes, make sure you know and check your size correctly. Many shoe manufacturers tend to run a half size smaller than your regular athletic shoe, so order wisely. The Adidas Pretereo III is one of the most popular shoes in the wrestling community. These lightweight wrestling shoes feature a mesh upper, with reinforcements around the ankle area. The upper construction is designed to promote foot agility as well as adequate breathability. Unlike other wrestling shoes on the market, these don’t require any break-in period. They are ready to wear straight from the box. Furthermore, they will not leave you with blisters, hotspots or any discomfort. Their upper construction is solid and the stitching is sturdy. As a result, these shoes will support and protect your feet for many years. These wrestling shoes for wide feet are equipped with a durable rubber outsole, which supplies reliable grip and traction in all directions. They are further fitted with an anti-slip lining, which prevents you from slipping or falling in the middle of a fight. The reinforced ankle area, combined with a supportive heel structure, ensures that ankles are properly aligned at all times, without hindering its mobility. At the same time, the lace-up closure ensures that your feet are securely locked down, thus preventing unnecessary movement when you are in the ring. The Adidas Pretereo III is a superb pair of boxing shoes, whether you are an amateur or a professional wrestler. They remain firmly on your foot while providing you with the support and comfort that you need. Another gem from ASICS, the Men’s Aggressor Wrestling Shoe, ASICS has remodeled and updated the legendary Rulon wrestling shoe with a new name and upgraded features to carry on the tradition. The features are proof that this is a shoe wrestler’s love. The wrestling-specific design was built using ASICS innovative wrestling last for an ideal fit for a wrestlers feet. The materials used were specially chosen to make the shoe as ultra-lightweight as possible while enhancing performance, making sure the fit is comfortable, and that it stands the test of time with exceptional durability. The upper portion of the wrestling shoe is made from Ecsaine, a microsuede that is supple yet sturdy and adds to its form-fitting and durable design. It’s also wonderful to make sure it’s as breathable as possible to keep your feet cool and dry throughout the match. The outer sole is made with DuoSole, a gum rubber, durable material that allows for tremendous traction. The dual sole design is also extremely flexible for pinpoint precision and control for the grappler who is in a tight spot and needs to make a match-winning split second move. Make sure to know your size as most wrestling shoes can run a half size smaller than the average shoe. The ASICS Men’s Omniflex-Attack Wrestling Shoe is a marvel of innovation that is sure to make grapplers lace ’em up and get ready for their next match. The design team set out to create a shoe for the elite competitor and serious wrestlers who want to take advantage of the years of insight and experience the fine folks at ASICS exhibit in their athletic footwear. Let’s start with the outer sole, newly designed PU traction pods of the Omni-Flex technology remains lightweight yet providing the superior traction and grip, no matter the surface of the wrestling mat. The two primary mat surfaces are traditional rubber mats and the newer polyethylene foam and vinyl mats. The upper is manufactured with Flexion fit technology for the most comfortable fit while form-fitting to the foot and the Compression-Fit Bootie System supports stability and feel while keeping the foot cool and dry throughout the match. The shaft of the shoe measures out from the arch at 5.25 inches. The lace garage is another innovation with laces and eyelets designed for speed and comfort as well as a personalized fit. Make sure to remember most wrestling shoes run a half size smaller than normal athletic shoes. When ASICS searches for experts to help design its elite athletic shoes, they find and hire the best. So for the Men’s Dan Gable Ultimate 3 Wrestling Shoe, they turned to the former world and Olympic champion Dan Gable who also became a legend as the head coach at the University of Iowa. The Dan Gable Ultimate 3 utilizes the latest and most significant features for its third generation shoe, including an Ecsaine (microsuede) upper which allows for incredible form-fitting fit and feel as well as breathability to keep the feet dry and cool throughout the match. The flexible Compression-Fit Bootie System supports the Escaine upper, creating a comfort chamber for exceptional cushioning and flexibility. The sole uses split-sole technology allowing for expert execution and technique with amazing traction. There are three traction zones, which allows for precise control and power giving the grappler the ability for split-second decisions and action to move when and where you quickly need to move your feet. The PU traction pods are durable and act like suction pods for added traction. With all that technology, the Dan Gable Ultimate 3 is still ultra-lightweight and affordable. Remember when selecting the right size, most wrestling shoes run a half size smaller than normal athletic shoes. The Adidas HVC2 Speed Shoe is a classic, innovative and affordable wrestling shoe with the retro look and feel wrestlers throughout the world love. The HVC2 Speed is built for hours of durability and comfort even during the grueling hours spent in training. The single-layer mesh upper is made to be ultra-lightweight with synthetic suede and synthetic leather materials meant to be durable yet flexible and comfortable. The material also allows for your feet to stay cool and dry with amazing breathability. The lacing garage is a combination of classic and new technology as the lace straps are elasticized, and the top area has a Velcro strap for greater control which helps for a personalized fit. The full-length rubber sole allows for traction and fantastic grip which gives the grappler the precise control for split-second moves and decisions when you need it the most. When Adidas when to redesign this shoe, they wanted to keep the things the shoe did best while adding newer technologies and innovations elite wrestlers demand. They accomplished that while keeping the shoe’s affordable price tag. Adidas wants its customers to know that when it comes to selecting the appropriate size, wrestling shoes tend to run a half size smaller than normal athletic shoes. The wrestling experts design the Adidas Performance Men’s Mat Wizard.3 Wrestling Shoe at Adidas, specifically for wrestlers who desire a more lightweight shoe for the lightning quickness elite wrestlers are known for. The materials used are synthetic and textile. The upper is made with a 3D mesh material for superior breathability to keep the feet healthy, dry and cool throughout training and the match. Lightweight support is possible thanks to its synthetic 3-Stripes technology. All the innovations and technologies that went into the advanced design of this shoe were geared towards the freestyle wrestler in mind. These advancements reinforce the exceptional foot support built in. The outer sole is designed for multi-directional gripping ability and is made in one piece for better support, feel and durability. The gum rubber compound used in the outer sole provides the maximum stickiness needed without becoming too unyielding when required by the different rubber and polyethylene foam and vinyl surfaces on more modern wrestling mats. Keep in mind, that Adidas cautions its customers to pay close attention when selecting the right size as most wrestling shoes tend to run a half size smaller than regular athletic footwear, so choose the size you need wisely. ASICS makes a bold claim when describing the Men’s Aggressor 3 Wrestling Shoe by stating it’s the most durable and best fitting wrestling shoe available on the market today. But who can argue with the results? It has all the advanced technology and features you’d expect from ASICS, and with an affordable price tag, it’s no wonder it can be found on the feet of wrestlers in gymnasiums throughout the world. The upper portion of the shoe is made with an Ecsaine material of ultra-suede mesh that is exceedingly comfortable and breathable to keep the feet cool, dry and healthy no matter how long the shoe is worn. The tongue is mesh as well, and lightweight and less bulky than its competitors. The outer sole is another area of advanced innovation as it utilizes super sticky and durable gum rubber compound yet remains lightweight. They’ve built in molded teeth for maximum balance and control. The split-sole design is made of traction pods that act like suction cups to give the grappler the precise foot control needed for advanced competition. The lace garage is integrated and allows for the laces to be securely tucked in, and the laces and eyelets are designed for speed. The fourth generation of ASICS Men’s Dan Gable Ultimate 4 Wrestling Shoe is designed for the elite wrestler as evidenced by the exceptional fit, feel and durability as well as meeting (or exceeding) all tournament regulations. The designers used Gable’s experience and superior wrestling knowledge he gained as a world and Olympic champion and legendary status as coach of the venerable University of Iowa wrestling program. They decided to revamp and upgrade the upper portion of the shoe by incorporating a compression-fit bootie system and covered it with a thin polyurethane support pods for incredible flexibility and a foot-conforming comfortable fit. They took some material off the bulky tongue with a thinner mesh and breathable tongue as well as an integrated lace garage system that has quick eyelets and laces as well as keeping the laces tucked in. The outer sole is also newly redesigned for outstanding flexibility and makes use of the excellent stickiness feel of the gum rubber compound. They also utilize split-sole technology to create what they call wrestling-specific individual zones for traction designed explicitly for the collegiate level. The traction zones also allow for more precise foot control and quicker movement. The Dan Gable Ultimate 4 lives up to its name. The Brute JS25 Elite Wrestling Shoe is the signature shoe of Oklahoma State University head coach (and former OSU All-American) and world and Olympic champion John Smith. One of the stand-out features of the JS25 Elite is the fact that elite grapplers love how the wrestling shoe as a sock-like feel and also is the most ultra-lightweight shoe on the market, clocking in at 7.25 ounces. The exceptional fit and feel are aided by an integrated, asymmetrical lacing garage that allows for a closer (yet snug) fit to your foot. There is also another comfort feature that wrestlers love and that is the sock liner, which is interchangeable. The upper is made from a MonoMesh material to makes it more lightweight and allows for the feet to stay dry and cool with all day wear because of its breathability. The gum rubber compound of the outer sole makes the shoe extremely flexible and gives the grappler more precise control when wrestling on the two main surfaces found on wrestling mats today, traditional rubber mats and the newer polyethylene foam and vinyl mats. The split-sole design allows the traction pods to act like suction cups giving the wrestler superior feel when needed. This shoe is already reviewed elsewhere on the list. It’s just a different color. In wrestling, the stance may seem somewhat basic. But any wrestler worth their salt knows that the entirety of the match can sometimes hinge on how the split-second cat-like move out of that stance can mean the difference between pin or be pinned. The designers of the Adidas Mat Wizard 3 certainly know a thing or two about the importance of a wrestlers stance. This is evidenced due to prime features of the Mat Wizard 3 like the die-cut EVA, an internal midsole feature that gives the wrestler that awesome feeling when preparing for the attack stance to start a match off after a point or break. Creating a show that combines performance, style and comfort were what the creators at Adidas wanted to accomplish, and so they have. The shoe is exceedingly lightweight (in a good way! ), and the materials used (particularly with the upper) allows for the wrestling shoe to fit like a sock (or glove, pick your own cliche). The mesh upper body is a choice of synthetic fabrics that make the shoe incredibly breathable, to keep the feet healthy, dry and cool throughout the duration of practice or a match. The gum rubber compound of the outer sole provides fantastic and precise control of movement. Superior comfort and excellent performance enhanced features are the gems highlighted in the ASICS wrestling shoe. The Omniflex-Attack V2.0 Wrestling Shoe has managed to pack tons of incredible features in a lightweight and affordable wrestling shoe. The stalwart design focuses on increased traction, comfort and a lacing system for a better-personalized fit. The lacing garage as the traditional eyelets and laces for speed and fit, but they’ve added a unique pocket where you can zip up to keep the laces tucked in, where they look like they’re not even there. They’ve also added a nifty Compression-Fit Bootie System which actually takes some weight away from the shoe while providing maximum comfort and leaves your feet more healthy as they stay dry and cool throughout. The synthetic mesh upper also adds to the shoe’s breathability. The gum rubber outer sole actually has a cool sounding name, the Omniflex Sole. What is impressive about it is the wrestling-specific zones built in for exceptional traction. These zones are called Octipods (cool, huh? ), and the strategically placed pods provide the type of grip grapplers dream of when they need that precise foot control for the split-second, championship-winning moves in the heat of a battle. This high-top beauty is Adidas latest entrant to the top 35 list. The Pretereo III Wrestling Shoe advances on the unique and favored features from the Pretereo II, with technological advancements to the upper portion of the shoe as well as a London 2012 Olympics-inspired outsole. These features provide an unmatched combination of innovation, comfort, and durability. Despite all the jam-packed features, the Pretereo III maintains it’s superior performance in a lightweight shoe which is amazingly affordable. Built to be ready when you get them without the need to break in, the gum rubber outer sole provides exemplary traction and gripping ability to give grapplers the precise control and stickability for split-second movement control. A pair of zones has been progressed for incredible driving force. The heel and ankle zones have been reinforced and supported by astonishing fit and feel. Another extraordinary feature is the anti-slip suede midsole lining and edge to make for consistent contact. The synthetic mesh upper portion of the shoe is a single-layer design to keep the feet dry, cool and comfortable all day and still manages to remain lightweight. When ordering keep in mind wrestling shoes tend to run a half size smaller than normal athletic shoes. One area of the foot tends to be ignored when it comes to athletic shoes, particularly wrestling shoes. But the Adidas Impact Wrestling Shoe attempts successfully to make amends for that oversight. The Impact pays particular attention to the medial area of the foot (primarily the middle area near the arch). By creating specific medial contours, better grip and contact is available to the area, for those grapplers who want to look for any advantage necessary when training. Adidas names the contour the RadialCurve, which is a medial supportive feature, designed to make use of the entire shoe, so there are no deadzones. In addition, the DriveZones feature is on the advanced, improved and innovative outsole. The cool thing is the concept creates a seamless upper portion of the shoe, for a smooth feel and better control. They’ve also made the entire top part more breathable for all-day comfort designed to stay cool and dry. The heel area has been advanced with extra cushioning for better support. And the forefoot boasts of a supple synthetic leather which is also more breathable and here’s the real kicker, the material doesn’t provide any extra grip so your opponent can’t take advantage of that. Adidas wrestling shoes deliver a unique combination of style, functionality, and quality. And the Response 3.1 is no exception. These men’s wrestling shoes come with a wide range of superb features, designed for fast responses, quick reflexes as well as hard takedowns. The upper features synthetic mesh, combined with Adidas Climacool technology. Therefore, your feet will always have adequate ventilation. The synthetic mesh upper fits your feet snugly, keeps your feet stable and provides ankle support at all times. Their shaft measures approximately 4 inches from the arch, with a 0.75-inch heel. These wrestling shoes for kickboxing are extremely durable. They come with a rubber outsole, which provides adequate traction. With these shoes, you can move around the mat confidently and execute your moves, without losing your footing. On the other hand, the rounded toe keeps your forefoot comfortable, allows toe splay and enables you to maintain a firm grip on the ground. If you are looking for a lightweight pair of wrestling shoes, which will give you a barefoot feel while enabling you to move around the mat easily, then the Adidas Response 3.1 is a good choice. These highly responsive wrestling shoes will enable you to avoid picks while helping you to deliver a match-winning performance every time. They are designed to give you everything that you will need in wrestling shoes. They are flexible, comfortable, lightweight and supportive. To start with, Adidas wants you to know that this shoe is being retired, so the supply is extremely limited. With that said, the Adidas Tech Fall 16 Rio Wrestling Shoe is a must-have for the elite wrestler. There are too many advanced innovative features to list in a 200-word review, so we’ll provide you with the highlights. The entirety of the shoe is represented when it comes to contact with the wrestling mat as the medial and lateral areas of the foot have been enhanced. This allows for more precise control and consistent contact especially with the extreme sometimes crazy angles grapplers find their feet in during matches. The upper portion of the shoe is made with a 3D single-layer synthetic mesh material for comfort and breathability. The tongue is full-length and made of mesh as well. The forefoot area has an abrasion-resistant material for added protection and support. The outer sole is made with triaxle technology for excellent contact with any surface and has superior grip. There is also a breathable, removable insert for added protection and stability. The outsole also has multiple contact points which act as suction pads for precision foot control and split-second cat-like moves wrestlers are prone to need. The Patriot Wrestling Shoe, by 4 Time All American, is a well-designed wrestling shoe with tons of tiny details that make a significant impact for a grappler on the mat. The material used for the soles of The Patriot is a gum rubber that makes the traction superior, regardless of whether you are wrestling on the traditional rubber mats or the newer style polyethylene foam and vinyl mats. They also allow a wrestler greater control and precise, split-second movement. The upper portion of the wrestling shoe is made with a synthetic material that provides for exceptional comfort and breathability to keep your feet healthy, dry and cool all day. Extra padding is designed into The Patriot for added support to the heel area as well as the ankle. Another advanced feature of the shoe is the upper and the sole are stitched together — as well as glued — for superior quality and long-lasting durability. The lace garage is designed with eyelets and laces built for speed, and a Velcro strap has been added to the top for a more comfortable, snug fit. The manufacturers would like to point out a sizing tip with wrestling shoes; many brands tend to run a half size smaller than regular athletic shoes. The Otomix Grey Stingray Escape is one of the best wrestling shoes for Olympic lifting. Made of synthetic and leather, these shoes will provide your feet with superior protection and comfort. They also have adequate traction, to ensure you have better control of your feet. A comfortable but stiff collar ensures that your ankles have adequate support and mobility. As a result, you can execute your moves freely, without breaking a sweat. Their support system is one of the best. These wrestling shoes for bodybuilding have excellent breathability. Regardless of how hot the weather is, these shoes will always ensure that your feet remain cool, fresh and dry. And when your feet are comfortable, you can always focus on winning the match. Since these shoes are lightweight, you can move freely on your feet in any direction, thus taking your opponent by surprise. They are perfect for exercises or situations that require foot stability and footwork such as deadlifts, squats and martial arts. These wrestling shoes are designed to perform well in situations where you need a strong base to launch your moves. The Otomix Grey Stingray Escape has one of the longest tongues that you can find in boxing shoes. The long tongue is designed to support the entire forefoot area, especially in situations where you have to push yourself to the limits. Also, the long tongue acts as an additional level of security, while cushioning your instep from the pressure exerted by the laces. On top of that, they come with ankle straps, which you can use to lock down your ankles to prevent unnecessary movements. Whether you are a wrestler or not, you will love the support, protection, and comfort that these shoes offer. From weightlifting, wrestling, bodybuilding to martial arts, these shoes are perfect for all these occasions. The Adidas Men’s Combat Speed.5 is a versatile, well-made, and jam-packed with features yet still affordable. The upper portion of the wrestling shoe is made with a synthetic single-layer mesh material constructed for comfort and breathability to keep the feet dry, cool and healthy all day long. The TPU stripes (three of them) are flexible and supportive combined with an integrated panel on the side (Integral Support Strap) meant to reinforce so as to fit like a sock (or glove). The outer sole area is made out of a split-suede leather material on the overlays. This handy feature allows for exceptional added grip. The midsole is made with an ethyl vinyl acetate (EVA) which is die-cut for added firmness yet remains ultra-lightweight. The lacing garage is classic with a modern twist. The eyelets and laces are designed for speed lacing while the Velcro strap at the top of the high-top wrestling shoe makes sure you get the most ideal, personalized fit when lacing up for your next big match. The gum rubber sole is designed for exceptional and precise traction control. When choosing the right size remember wrestling shoes tend to run half a size smaller than normal athletic shoes. It’s only appropriate the since ASICS started off this top 35 list that it finishes it off. The Men’s JB Elite III Wrestling Shoe is the third generation shoe endorsed and designed with the help of world and Olympic champion Jordan Burroughs. The same features that made the first two incarnations of the JB Elite exist, but several have been upgraded or improved. The upper portion of the wrestling shoe is made of an open mesh material for excellent breathability and maximum comfort. The lacing garage system utilizes traditional laces and eyelets (with a nod towards more speed lacing) while adding a leather pocket at the top to help tuck in and hide the laces to keep them more secure. The construction of the shoe uses the innovative seamless technology which takes away the friction and irritation sometimes caused by seams and stitches. The outer sole uses a split-sole design which adds great flexibility and precise traction control for when you’re in that tough spot and need to make a split-second cat-quick move to humble your opponent. The gum rubber sole is excellent for grappling on traditional rubber mats or the newer polyethylene foam and vinyl mats popular nowadays. When it comes to equipment, the sport of wrestling is about as simple as you can get. There’s the required uniform or singlet, the headgear, mouthpiece and of course the shoes. And in all seriousness, wrestling shoes are the most important piece of equipment a grappler needs. A great pair of wrestling shoes should be lightweight, fit exceptionally well, and the traction or grip of the soles should be sticky, but not too sticky. The market has plenty of options to choose from nowadays, as brands like ASICS, Adidas, Nike, Reebok, among others make wrestling-specific footwear, sometimes designed with the help of stalwart wrestling legends like Jordan Burroughs, Cael Sanderson, and Dan Gable. Of course, when it comes to choosing the right wrestling shoes, the skill level of the athlete does matter. For a weekend warrior who may just be wrestling for fun, buying wrestling shoes with super advanced features with an expensive price tag may not make much sense. Same goes for the youngster just starting out. A classic, dependable and inexpensive wrestling shoe should suffice. But for the elite wrestler, either at the high school or collegiate level, careful consideration should be spent to determine the correct shoe for your particular skill level. But what makes for a great wrestling shoe? Let’s explore that question a little further. What Makes A Good Wrestling Shoe? First off, the sport of wrestling itself needs to be briefly understood to make sure you know the reasons why the shoe is such an important part of the uniform. The wrestling we are talking about isn’t the matches you see on TV known as professional wrestling. Pro wrestling is more theatrical whereas freestyle or Greco-Roman wrestling are the disciplines we’re referring to. The origins or wrestling have actually been dated to around 15,000 years ago as cave drawings in France have shown the importance of the pastime to those cultures. Flash forward to modern times, and wrestling is a big-time sport for high schools and colleges throughout the United States and amateur federations throughout the world. It’s a popular Olympic sport. And freestyle wrestling has increased in popularity over the past decade thanks in part to the wrestling exhibited in Mixed Martial Arts (MMA). MMA combines different disciplines like boxing, martial arts, and of course wrestling. So many grapplers are trying out wrestling to learn skills that could translate to better performance at MMA. The sport is the built around the combination of technical skill and physical and mental strength. Many wrestlers will tell you they feel the training that goes into being a successful wrestler is the toughest part of the sport. And it’s a sport of lightning quick movements, so literally thinking rapidly on your feet and anticipating your opponents moves can be as important as the ability to physically overwhelm your opponent. Wrestling is a sport where equipment choices don’t provide too many competitive advantages, but shoe choice can be one, or at the least, the wrong decision can be a disadvantage you want to avoid. And at this point, it’s fair to point out the intrinsic value of wrestling shoes to a successful wrestler. If a wrestler slips for a split-second or loses their footing because of an ill-fitted shoe, it could mean the difference between a win or a loss. Such is the nature of a sport where a quick takedown can spell doom to an opponent within a few seconds. Two factors are usually considered to be of paramount importance when it comes to choosing the appropriate wrestling shoe: the fit and the sole. First, let’s take a gander at the material used to make the sole of a wrestling shoe. Pretty much every wrestling shoe on the market utilizes a type of rubber compound for the soles. Rubber is important because it helps provide the proper traction for the different surfaces wrestlers will wrestle on. Those surfaces tend to be a type of rubber mat (the old school variety, but made with a modern PVC rubber nitrile foam) but many current wrestling mats are made out of a polyethylene foam. Why is this information important? Simple, the soles of the wrestling shoe must have the proper contact with the mat. Too sticky can cause missteps, and too slick, and the sliding can spell doom. Of course, an ill-fitting shoe can cause similar issues. But the traction is the most important reason for the choice of material. Some wrestling shoe manufacturers will even add studs to the soles, for extra traction control. There are actually two primary types of soles on modern wrestling shoes, the split sole, and the non-split sole. The split-sole adds more foot flexibility, for the wrestler that likes more control. The split of the sole is generally front and rear, though some take it a step further by adding a third zone towards the front middle of the shoe. The non-split sole is more traditional and is just one piece of rubber. Non-split soles tend to be lighter, and while more rigid, some wrestlers like that, especially because split-sole wears down quicker so isn’t as durable as the non-split sole variety. Ankle support is an issue for some wrestlers. You don’t necessarily to have weak ankles or ankle soreness to like the high-top shoes. Some grapplers tend to like the added support and feel of a high-top wrestling shoe. But, indeed, for those athletes who have ankle issues, a high-top wrestling shoe can provide crucial added support for ankle issues which can affect performance. The upper portion of the wrestling shoe is undoubtedly important, especially when you consider that a comfortable fit and upper materials that keep the foot cool and dry can make the world of a difference. Hot and sweaty feet can lead to problems like athlete’s foot, foot fungal infections, or in the heat of the moment of a crucial match, hot feet or feet that become uncomfortable can affect performance. So many modern wrestling shoes are now made with synthetic leather (suede) materials that allow for maximum comfort, fit, feel, and health. These materials can keep the feet cooler and dryer, and anything you don’t have to worry about in the intensity of a match or the high focus of training can be significant. The proper materials we’ve just mentioned can also play into infection-causing germs which you could pick up on the wrestling match, and conditions like athlete’s foot or fungal infections can be caused by heat and sweat that goes unchecked. So materials used that maximum support breathability is a feature you should consider to keep your feet as cool and dry as possible. The proper fit is extremely important and it is something any wrestler should take their time to find the exact fit. Ideally, a grappler should try to find a wrestling shoe that fits like a sock or fit like a glove fits the hand. Many shoe companies caution their customers to know their normal athletic shoe size. Why? Well, some brands wrestling shoes tend to run a half a size smaller than regular athletic shoes. So a good rule of thumb if you are ordering online is to try a half a size larger than your street shoe or athletic shoe size. And one huge disadvantage to a loose-fitting wrestling shoe is losing your footing at a crucial point within in the match. This can set back your development if you’re losing because of ill-fitting equipment. In addition, a shoe that doesn’t fit right can lead to injuries, particularly to the ankle, which you certainly want to avoid. And with any shoe that you purchase, there’s no true answer as to the right size, except for when you try them on and know they are right. Still, beginners will take buying a few pair before they know for sure what their typical size will be. Elite and experienced wrestlers do tend to like their wrestling shoes to fit very snug. Why is this? Well, it’s a powerful thing for your mind to gain the right amount of control over the feel of your feet with the right wrestling shoe. So being able to “feel” the precision and touch (pressure, more like) is something that experienced grapplers seek to gain an advantage of. Of course, this does take many years to develop. But the start of this development begins with your first pair of wrestling shoes. Of course, if you’ve never ordered wrestling shoes only, you might want to go to a physical store, in person, and try them on first, get a good impression of your ideal size, then go home and order the wrestling shoe you desire. Another good thing to consider when purchasing any type of athletic footwear, especially if you aspire to become a serious competitor, learn everything you can about the wrestling shoe. From the materials used to why they are used. It’s a double-edged sword when you think about. Since wrestling is becoming so popular, the sports shoe market is inundated with choices. And of course, each shoe brand is going to make bold boasts and unsubstantiated claims of greatness. That doesn’t mean their right, and it doesn’t say their wrong, either. But, truth in advertising allows you to dig deep and research yourself. A good search engine on your browser and an inquisitive mind can provide you with the answers you need. Find out whatever you can about everything you can about this important equipment choice and eventual purchase, that way you are assured at making a wise decision and make sure you have one less thing to worry about when you step on to that wrestling mat and grapple with your opponent. Now that we’ve discussed the importance of wrestling shoes to the performance of grappling successfully, it’s important to know how to take care of your shoes. Cleaning your shoes is something you should do after each training session and each match. So what follows is a brief tutorial on the best way to clean your wrestling shoes. How To Maintain Wrestling Shoes? First off you’re going to require a cloth, warm water, and a plastic tub or container. Fill the plastic container with warm water. Adding soap or any type of chemical cleanser is unnecessary and could actually damage the materials of the shoe. Remember, your wrestling shoes are an investment, and proper care can help you extend the shelf-life of your shoe. Place the cloth in the water and squeeze the water out, so the cloth isn’t too soaked, just damp. Then using soft circular motions, simply clean all over the wrestling shoe, don’t scrub too hard so as not to harm any of the materials. It’s a good idea to change out your laces when they begin to fray, and take them off from time to time to clean them. Warm water works for laces. Don’t use a brush or hard, coarse material on the materials of the wrestling shoe. It’s also important to consider how you treat your feet to keep from getting conditions like athlete’s foot or fungal infections. One additional step to take when cleaning your wrestling shoes is to clean the inside of them as well. Once again warm water can be used, and for the inside of the shoe, you can use a tiny amount of laundry detergent, but not too much as this can cause skin irritation. You can start by shaking out any excess dirt, then taking a damp cloth with the warm water (and detergent if you like) or even use a soft-bristle brush with the water and clean the inside fabric of the shoe, then just let the shoes dry for a bit (around 30 minutes) before putting them on. Socks are an important impediment to foot problems. Socks made to keep moisture away from the foot are a good choice, so purchase socks made with polypropylene and Capilene (instead of cotton) can be advantageous. Also, keep in mind to change socks often if necessary. Dry feet tend to be safe feet. So keeping feet dry is important as is using an absorbent foot powder (several over-the-counter powders should work, some even medicated). Remember must fungi that affect the feet need moisture to thrive, so do what you can to keep your feet as dry as possible. 2.1 What Makes A Good Wrestling Shoe? 2.4 What Else To Consider? 2.5 How To Maintain Wrestling Shoes?